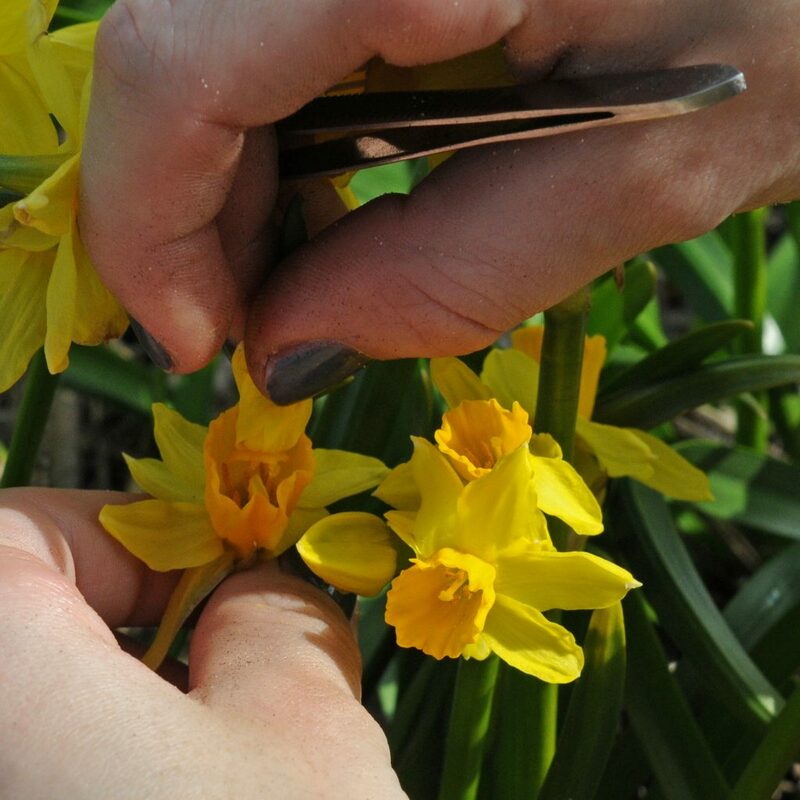 Creating new daffodils is by far not as difficult as you might think. 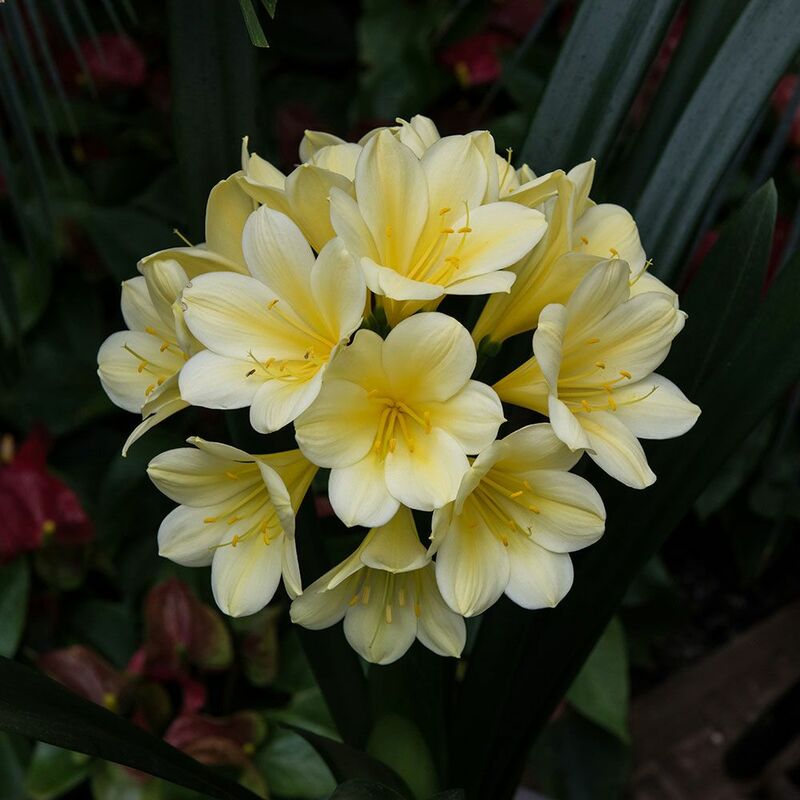 In fact, it is one of the easiest plants to hybridize. When you cross-pollinate two daffodils, you will very often be able to harvest some seeds after a couple of months. Every single seed you harvest is a new daffodil because with daffodils, same as with humans, not a single seed will look the same as another. To cross-pollinate, you first choose two varieties you fancy. This can be anything, just choose two you like. When you look in the flowers you can easily find the pollen and the stamen. All you have to do is collect pollen and put that on the stamen of another variety. 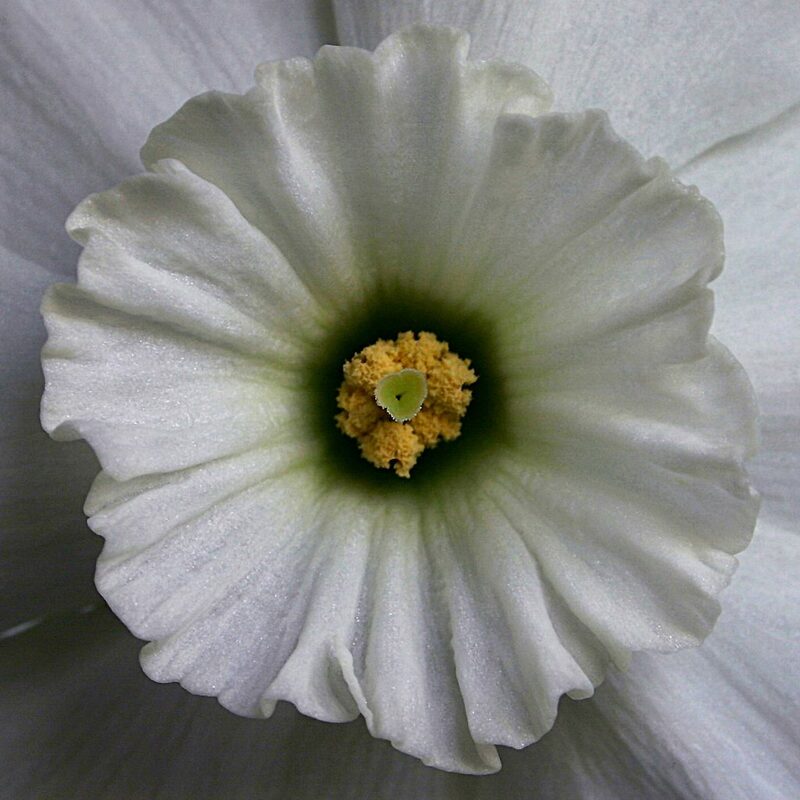 To do so you can use a pair of tweezers to pick an anther with pollen, but I usually just pick a flower of a pollen plant (also called the “father” plant), flap it open and smear the anthers over the stamen of the “mother” plant. After you have done this, you will see that the pollen easily sticks on the stamen. 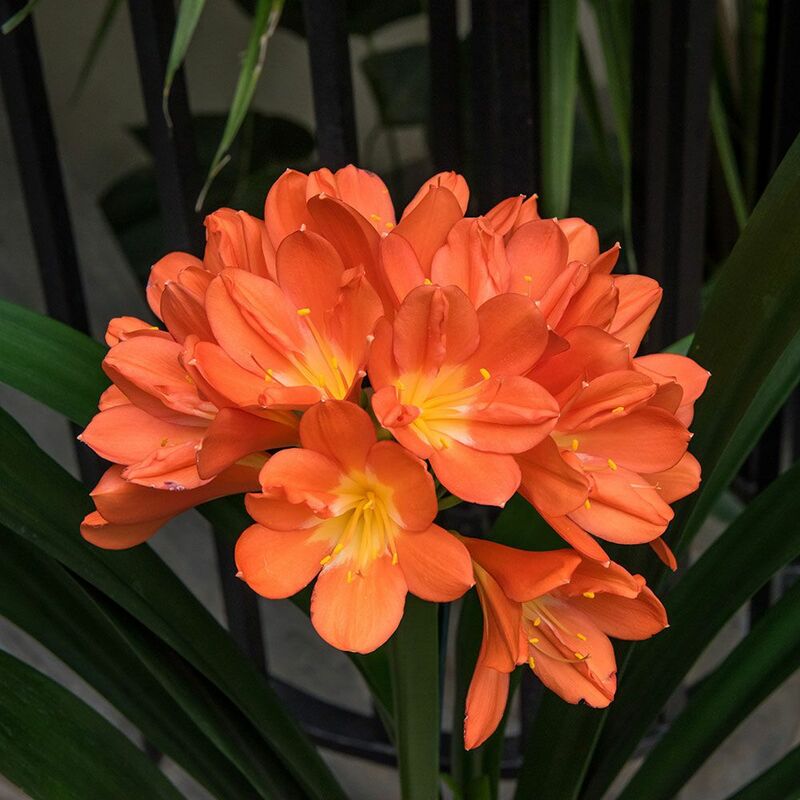 Be careful not to bruise the stem, neck or flower of the mother plant because on her flower the seeds have to grow for about eight to 10 weeks. 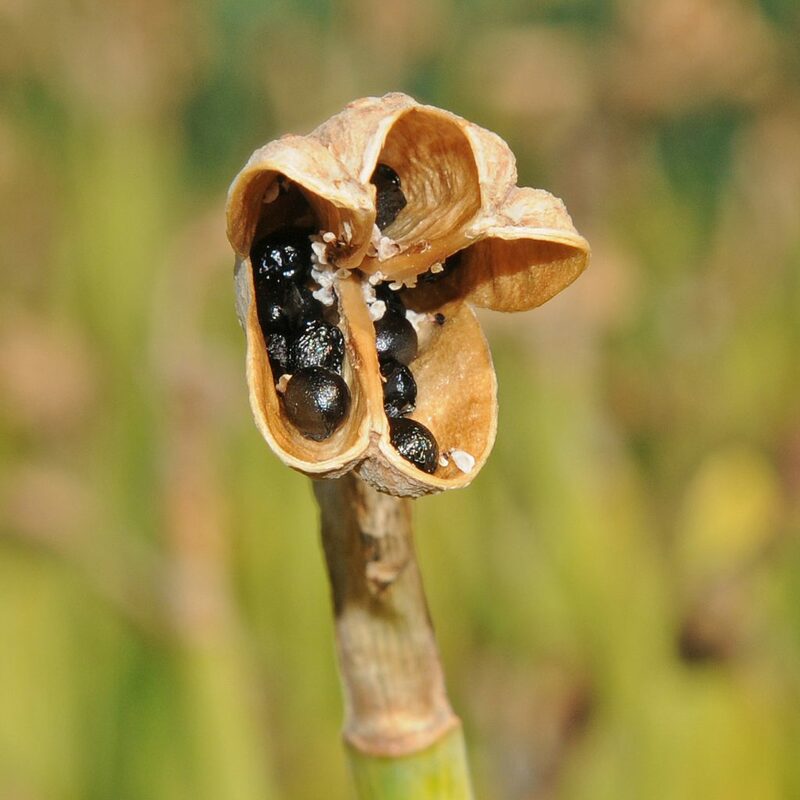 During these eight to 10 weeks, you will see the seed bud, which is hidden on the back of the flower, slowly grow, and during the coming eight weeks it will swell to the size of a marble. This size goes for a standard daffodil. When you pollinate smaller daffodils, you will have smaller seed buds. 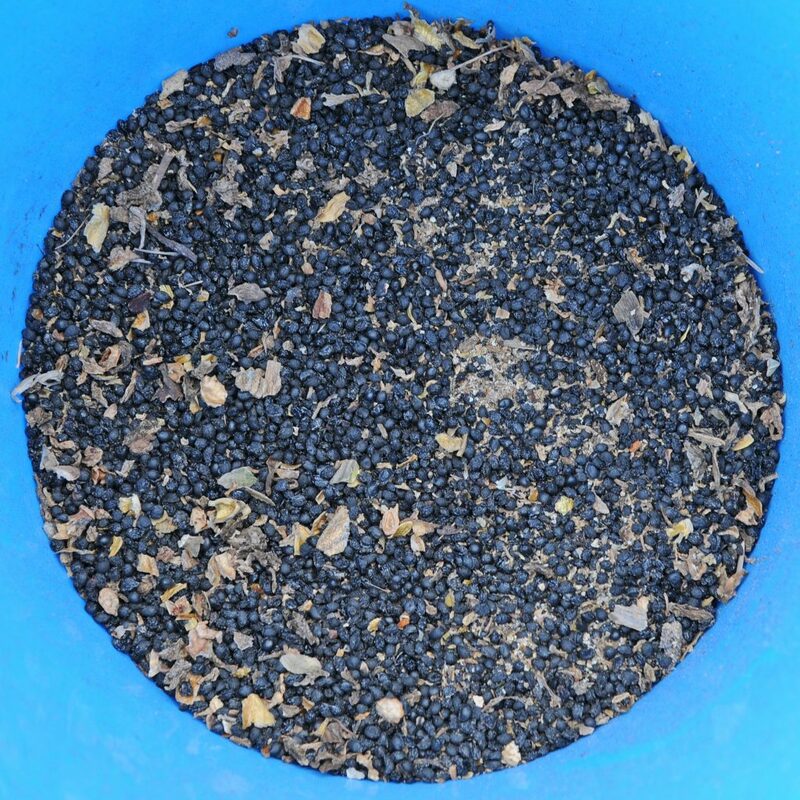 After about 8 weeks, you have to be careful to inspect the seed buds often, and when they start to turn brown and shrivel a little bit, they are ready to harvest. When you are too late inspecting them, the seed buds might burst and the seeds will fall on the ground where they are hard to find. The seeds will be the size of a pinhead. Seeds from large daffodils will be slightly bigger. Seeds from miniature daffodils will be smaller. But now a part of the story that might be a little bit disappointing: you have to nurse the seeds for five to six years before you will be able to see your first results. It will take this long for the seed to grow to a large enough bulb to produce a flower. But to grow the seeds you really do not have to do much that is different from growing other daffodils. 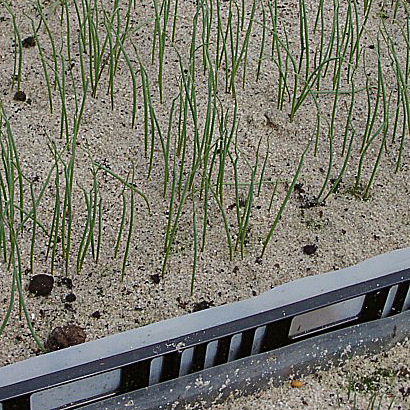 In the fall, you plant the seeds, no deeper than half an inch, in a pot or tray. This pot can be planted in the garden in a spot where you also plant your other bulbs. In the first spring, you will see each seed producing one single leaf that will not be much bigger than a leaf of grass from your lawn. 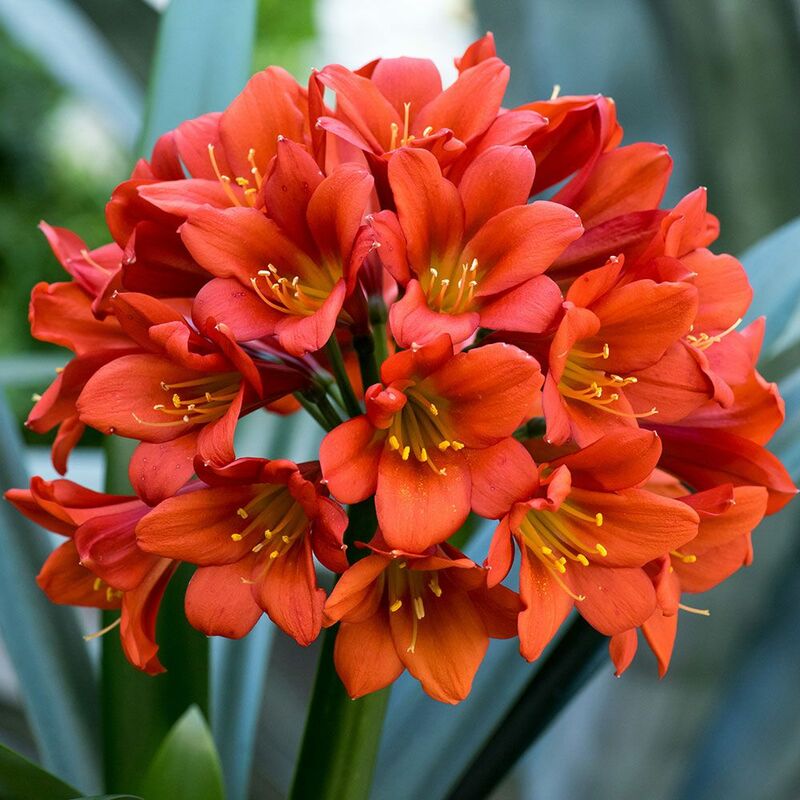 The reason for planting them in a pot or tray is that you do not have to dig them after the first year of growing. In the first year, the seeds will grow into small daffodil bulbs, but these bulbs will be hardly bigger than the seeds you planted. So digging and replanting will be difficult because you might not be able to find all the little bulbs. So I usually leave the pot or tray with seeds in the ground for at least three years, and all I do is keep them free from weeds. After that, the bulbs really need replanting every year to give them more space. 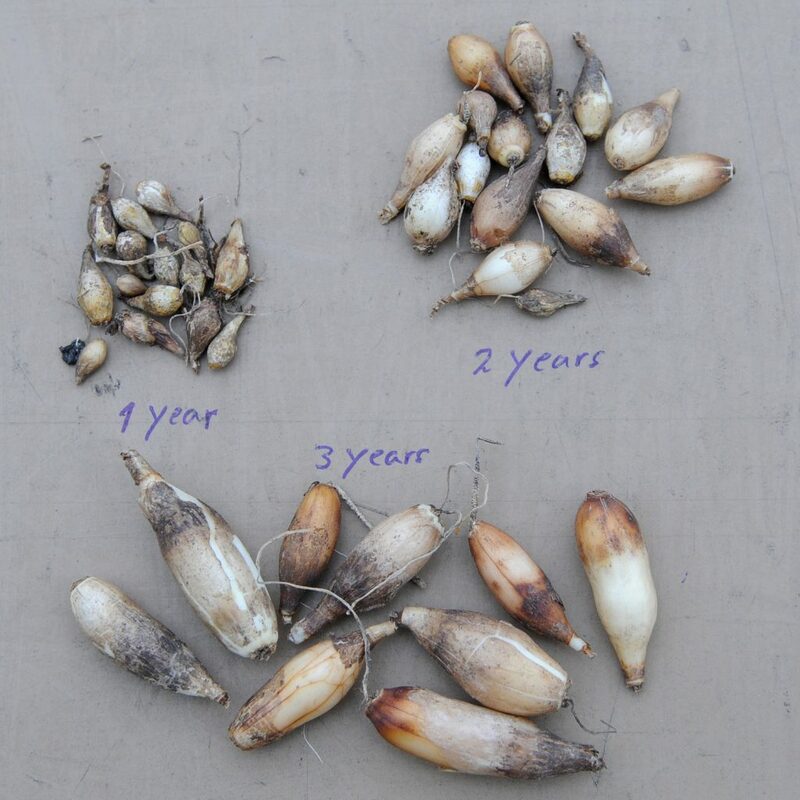 Bulb size is increasing rapidly these years so spacing will become more important. 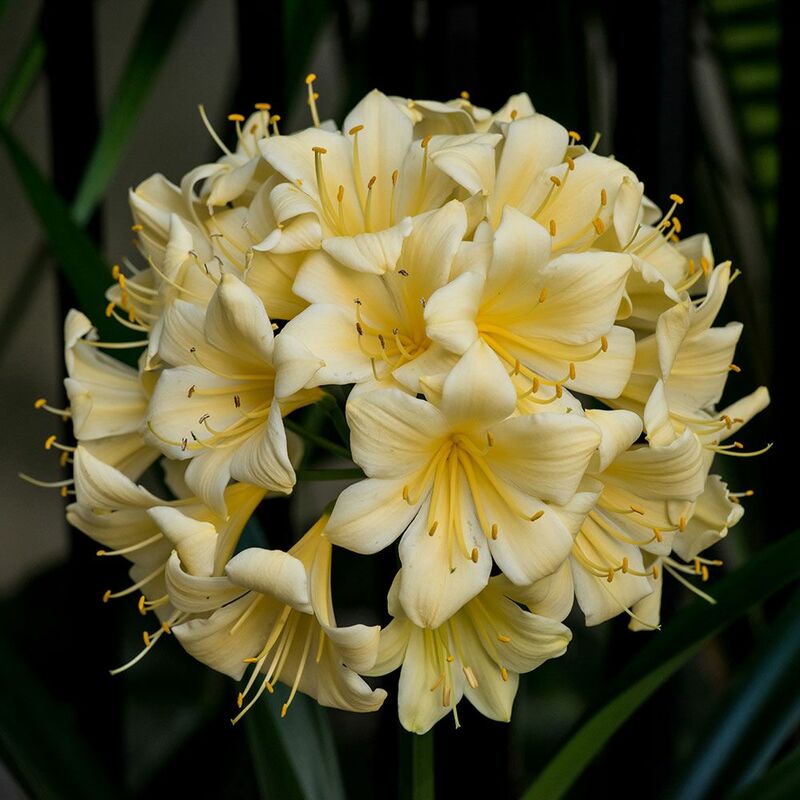 When you dig the seedlings in the fifth year, you will see that some of the bulbs have grown big enough to produce a flower. And finally in the sixth spring you might see your first creations, and you can really start to enjoy them. Some of your seedlings might need another year to grow big enough to produce a flower. Not all of them are beautiful so selecting needs to be done. The good-looking ones may stay; the rest end up in the hedge or on the roadside. During the next five years, sometimes even more, you keep on selecting, and only the ones that perform well year after year remain. For me the criteria for selection are, in the first place, a good-looking flower, but equally important is its garden performance. I prefer the flowers to be well above the leaves and not too much down-facing, and they have to look healthy and vigorous. Sometimes I discharge a nicer flower compared to the others because the others just are better looking plants and better performers in the garden. Now after more than 10 years you finally might have a daffodil worth keeping, and you want to name her. 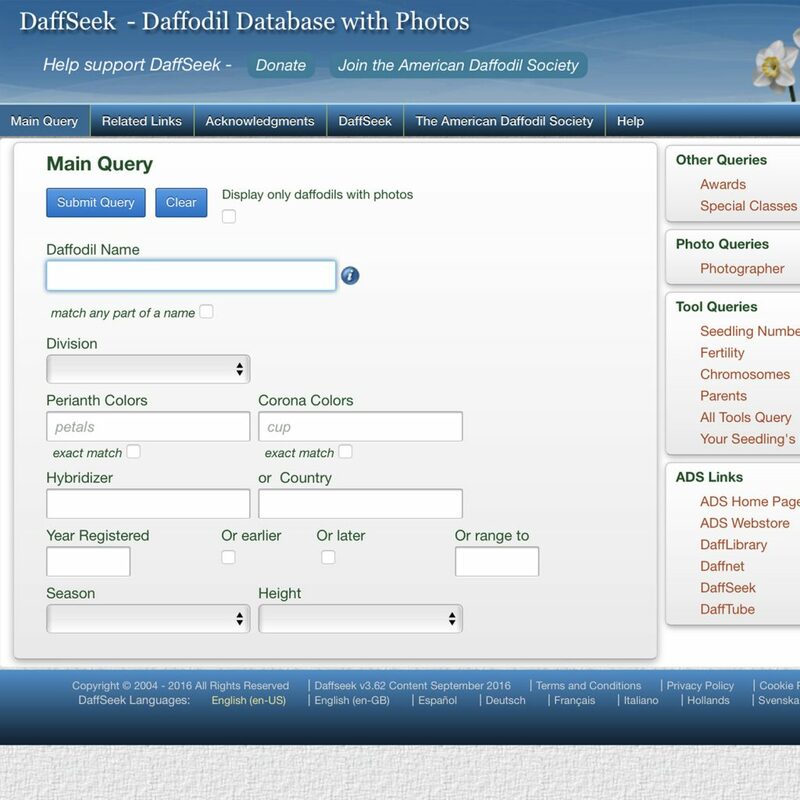 To name a daffodil, you go the Daffseek website, http://daffseek.org, this is a database of the American Daffodil Society. This is a perfect place to check to see if the name you have in mind for your daffodil already exists. A name has to be unique, and already over 25,000 daffodils are named, so you might find it hard to come up with something original. 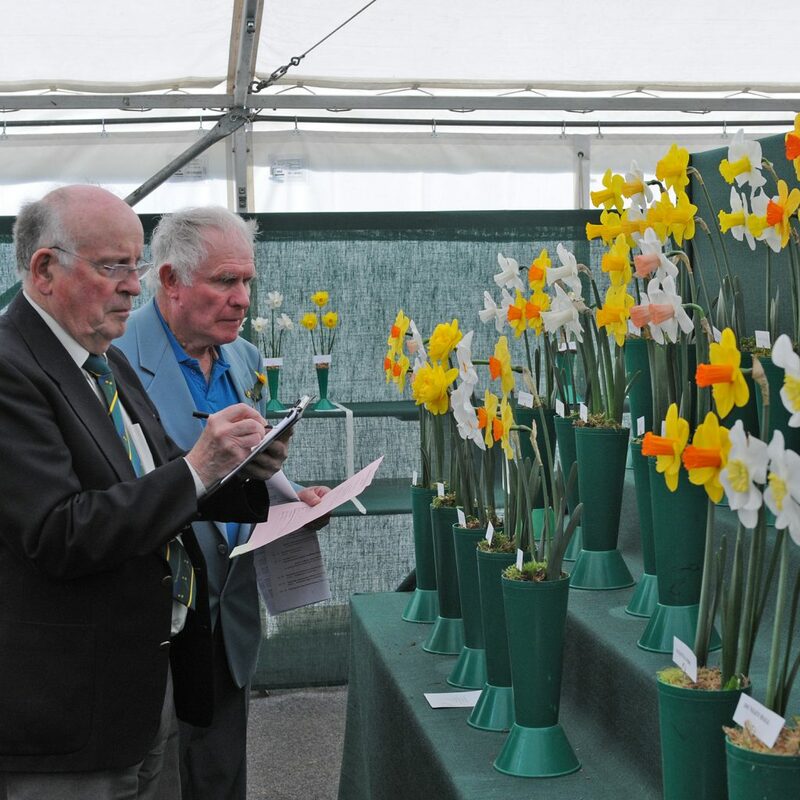 But once you find a name, you go the related links on the Daffseek site and they will forward you to the Royal Horticultural Society site (RHS) in the UK where the worldwide registration authority of daffodils is settled. But before you name a daffodil you might want to know what other people think of your seedling. Best thing to do is go to one of the many daffodil shows that are held each spring by numerous different daffodil societies throughout the United States. You might be able to find a daffodil show close by on the website of the American Daffodil Society [http://daffodilusa.org]. Everybody can enter flowers in these shows, and judges are present to evaulate your blooms and advise you. When it is a good flower, you even might win a ribbon. 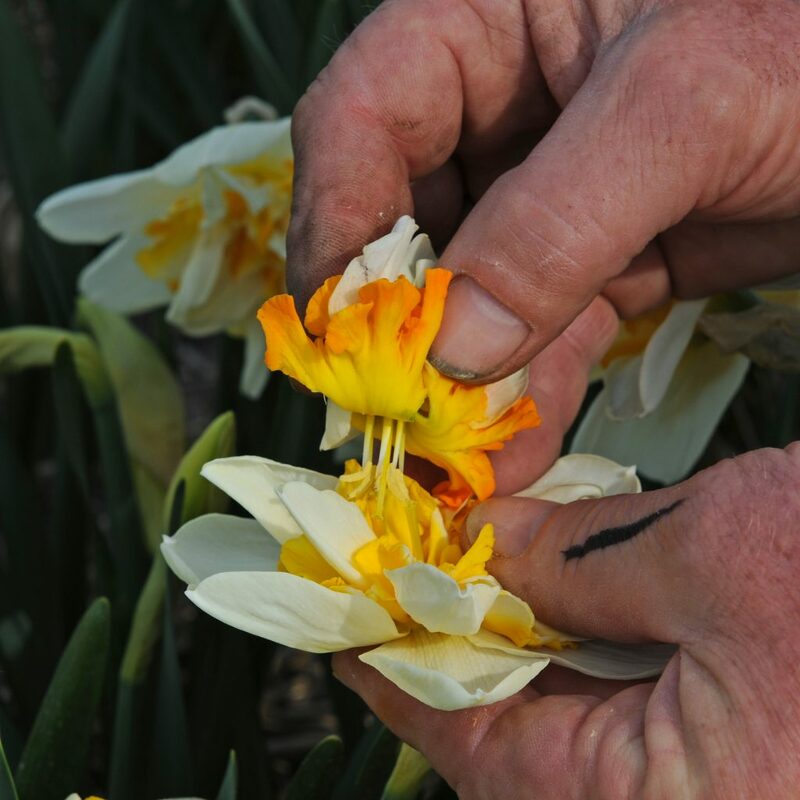 When you are interested in hybridizing daffodils, it is best to first collect a wide range of varieties so you can find out which are most appealing to you. A mixture like The Works is an ideal start. Made up of 30 top quality varieties, it will provide you with a broad range of different daffodils to pick from. Good luck with the breeding.